The web has certainly opened the venues for the exchange of views on pens, inks, stores and companies. I regularly get asked about what I think about a particular pen, ink, store or "event" in the world of pens. 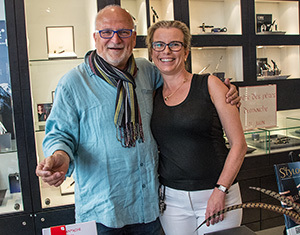 Pen Stores - Standing the test of time - Charals and Vancouver Pen celebrate 25 years of operation in Vancouver. 10-04 - Who Sets the Price for Pens? 10-01 - Ink - The life of the fountain pen! 09.11 - Buying gifts for a pen person - easy! 09.04 - Using a Fountain Pen... Pretentious? 09.01 - When to use your fountain pen? When it matters. 08.12- The market for pens. Are prices too high? 08.08 - High End Pens - Who is buying these pens? 07.02 - Pen purchases planned or on-the-spot reactions. New Waterman Edson Black Diamond is testing my philosophy. 07.01 - Who are Buying Pens Anyway? 05.12 - The end of another year and the pen business is looking good! 03.08 - Accessories are important too! 07.03 - Keeping ink out of pens? 03.01 - Don't let your local pen store die!